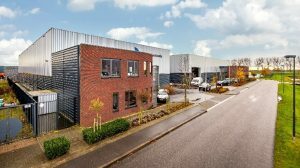 Rotterdam 20 December 2017 – Equity Estate has expanded the Propco portfolio by acquiring a warehouse building with offices, located at the Zuidbaan 525-527 in Moordrecht. The buildings, that originates from 2007, are purchased from and leased to Gouda Constructie B.V., a welding and construction company, at a long-term lease contract, and partly leased to Vitamine & ZO B.V., a fresh fruit delivery company. The buildings consists of approximately 4,500 sqm of warehouse space, 600 sqm of office space in total and paved outdoor area with 80 parking spaces. The property is located on business park “Gouwe Park” directly adjacent to the A12 and A20 motorways. Abram Makelaars advised the seller, Gouda Constructie B.V., in the deal. The buyer, Equity Estate was represented by INDUSTRIAL real estate partners.